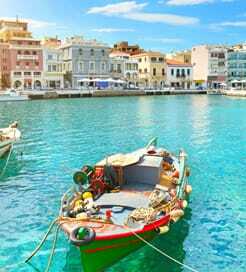 The beautiful island of Crete is the fifth largest island in the Mediterranean Sea and the largest of the Greek islands with a population of around half a million people. Despite its thousand kilometres of coastline, Crete is not just about sun, sea and sand. This distinct island is full of vitality, rich in culture and with warm, hospitable people. Though well known for its seas and beaches, Crete has a very contrasting landscape. The island goes from fertile coastal plains to rugged mountains and from busy metropolitan cities to very peaceful hillside homes. As a hugely popular holiday destination, Crete features numerous types of holiday accommodation ranging from luxury hotels to apartments and camp sites. Getting a ferry to Crete is quick and easy with numerous ports of departure and crossings run by many different ferry companies from the mainland as well as from the islands of the Dodecanese and the Cyclades. Ferries run from the mainland port of Piraeus (Athens) to the 3 ports at the north side of the island all year round. 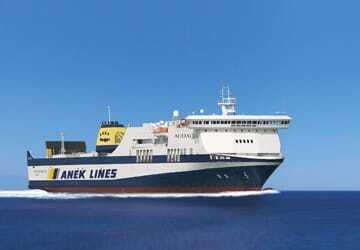 The shortest and most regular ferry crossing is to the port of Heraklion in the central part of Crete’s north coast. If you are travelling to Crete from the Cyclades region, north of Crete, you can travel from up to 6 islands including Mykonos and Santorini. From the Dodecanese group, north east of Crete, there are weekly ferry connections from up to 5 islands, including Rhodes.